It appears that famous jailbreak hacker MuscleNerd visited Apple’s headquarters in Cupertino earlier today, starting rumors of Apple potentially hiring another key member of the iOS jailbreaking community. The news comes from MuscleNerd himself who uploaded a photo on his Twitter account. 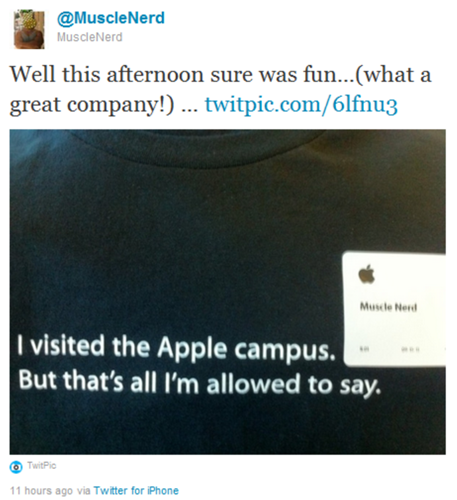 The photo shows MuscleNerd wearing a shirt which says, “I visited the Apple campus. But that’s all I’m allowed to say.” along with a nametag which has the Apple logo on it along with the name “Muscle Nerd”. If you’ve been following the news lately, you’ll know companies like Samsung, Apple and Facebook have been picking up and hiring high-profile hackers from the Android and iOS hacking community. Apple picked up developer of jailbreak tweak Mobile Notifier Peter Hajas back in May. Facebook hired famous iPhone/PlayStation 3 jailbreak hacker George geohot Hotz back in June. It was then reported that Samsung Mobile hired Android hacker Steve Cyanogen Kondik in August and, most recently, Apple hired 19 year old developer of JailbreakMe (the first tool to jailbreak iPad 2) Nicholas comex Allegra. One, then, really can’t help imagining as this being an indication of MuscleNerd being hired by Apple. 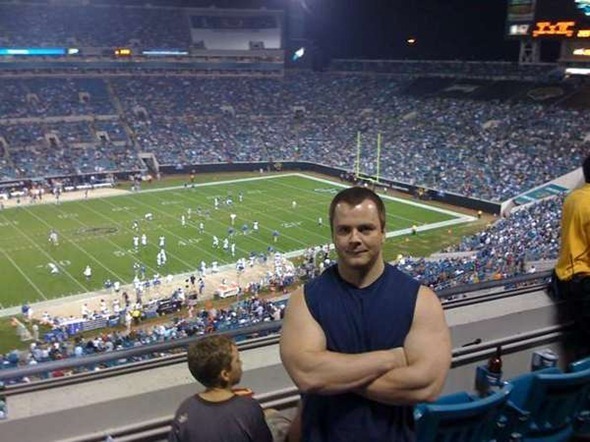 MuscleNerd, after all, has been causing Apple trouble for a long, long time; he is a part of the iPhone Dev Team which is responsible for popular jailbreaking tools like Redsn0w and PwnageTool. By hiring MuscleNerd, Apple will be able to ‘fight’ jailbreaking even better. While we wouldn’t want him to leave, we imagine MuscleNerd would want to work at Apple. Despite all the hard work he does, MuscleNerd really doesn’t make anything off hacking iOS devices and working at Apple would, well, help him financially. Besides, working at Apple is a lifetime opportunity that no one would want to miss. We wish all the best to MuscleNerd. Whether he has actually been hired by Apple, or if this was just a casual visit, only time will tell.